What if you could cut mixing and application time in half when installing self-leveling material? A Graco Self-Leveling Pump makes it much faster and easier to apply self-leveling overlayments and underlayments. It can be an exercise in frustration to hand mix bag after bag of self-leveling cementitious topping, then slowly apply it bucket by bucket on a job site. Instead of placing overlays and underlayments this way, Graco offers pumps for self-levelers that ensure smooth, even mixing and easy application in a process that’s much more efficient. Graco Self-leveling Pumps can handle even the largest jobs, which previously meant hauling pallets full of bags across job sites repeatedly, then prepping, pouring and leveling along the way. Instead, site workers can now establish a location for a mix station, engage the self-leveling pump action and deliver fully mixed compound across the area needed. Workers can easily load four bags a minute into a pump, where it can be mixed with aggregate and liquid to proper consistency automatically. Application is simple, as the material is pumped out to where it is needed. There’s nothing worse than coming back to check on a job and seeing a lumpy, inconsistent mix that will have to be redone with huge expense in manpower and materials. That said, consistency is never a worry with this pump. Every application with a Graco Self-Leveling Pump is smooth and even. Pump vertically or horizontally over long distances and know the application will be consistent every time. You’ll never worry about the results of a job, because it will always look great. The entire pump setup is compact and easy to operate, right from the first time it’s used. It requires very little square footage. You can fit the pump, a mixer and a small generator in the back of a pickup truck. 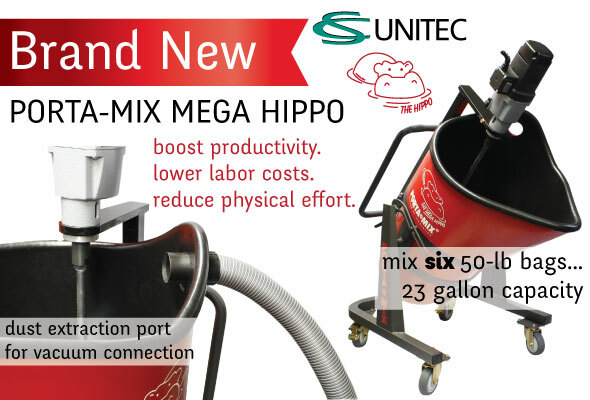 You’ll see big cost savings from purchasing this efficient pump. Take it to the job site and set it up anywhere in short order. Mix the right amount of compound every time, so you never have to deal with the cost or hassle of wasted materials. The pump makes it much easier to hit completion deadlines and keep projects on track. Even under intense time pressure, your crew can drive it to the site and tackle a large job within a short time frame. Quality will never suffer in the process, because you can rely on it to produce an even finish. This means you can blast through jobs and save time for your crew. Over time, you’ll see a major cost savings for your operation. Contractors who use these Graco self-leveling pumps are able to cut work time in half or even more, due to the fast set-up and application it offers. We offer a comprehensive selection of single component pumps designed for mortar, cementitious and heavily-filled materials, transfer pumps for moving A and B materials to reactor proportioners, and hydraulic and hydraulic piston pumps for factory and outdoor use.